It may still feel a bit chilly outside, but this is the perfect time to start thinking about your summer vacation in Clinton County, Illinois. Carlyle Lake is a big draw, and you’ll find there are some great camping and RV-ing options around it. To insure you get a choice spot, it pays do your homework now—and we’re here to help with a list of a few popular campgrounds in our area. Check our Clinton County Tourism website for more great places to stay. Eldon Hazlet State Recreation Area. This is the largest and one of the most desired spots, close to all the Carlyle Lake action. The Illini Campground offers picnic areas, playground, restrooms, and 328 Class A campsites with electrical hookups, 36 Class C campsites for walk-in tent camping, and two rustic rental cabins. A campground store and public swimming pool are added attractions. Carlyle Dam West Campground. This is another choice setting, offering boat ramps, courtesy docks, and 109 campsites. There’s a wide range of amenities, including picnic shelters, flush toilets, a playground, and amphitheater. Carlyle Dam East Campground. On the opposite side of the lake, this property has 15 non-reservable campsites, as well as a picnic shelter that can accommodate up to 75 people. A courtesy dock and high water boat ramps are available, and the beach is nearby. Coles Creek. Located on the eastern shore of Carlyle Lake, Coles Creek has 199 sites plus two large group campsites, all with electric hookup and modern amenities, such as showers, flush toilets, and laundry facilities. An on-site playground, open space, and amphitheater add to the family-friendly atmosphere. Boulder Recreation Area. Sitting along the shore with nice shade areas, this campground offers 83 sites with lake views and picnic areas. The property has a playground and lots of open space for activities, as well as flush toilets, showers, fuel and boat storage. McNair Group Recreational Area. Connected to the Dam East facilities, this campground offers accessible campsites with a nice swimming beach, bathhouses, and laundry. Nature trails and a multi-use trail provide some off-water options. 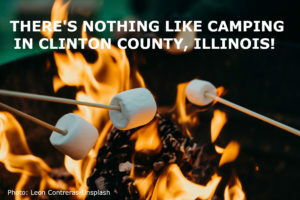 Visit our website for a complete list of campsites—then book a trip to Clinton County this summer! This entry was posted in Boating and sailing, Fishing, Local Businesses, Lodging, Outdoor activities and tagged Carlyle Lake, Clinton County business, Clinton County tourism, outdoor activity by admin. Bookmark the permalink.